Real Estate Investors of Virginia: Western Virginia Water Authority - Full Frontal Attack On YOU!!! Western Virginia Water Authority - Full Frontal Attack On YOU!!! 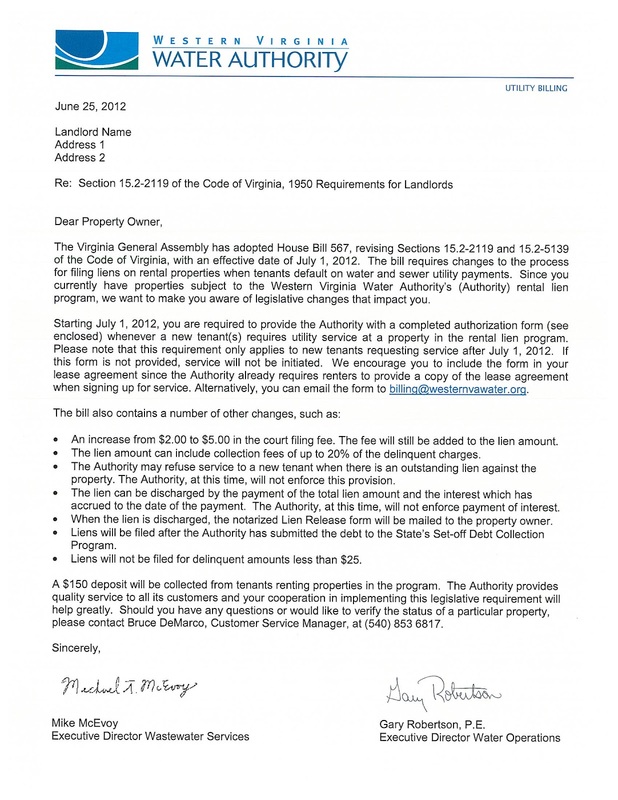 The Western Virginia Water Authority has asked me to send this information to you as they have now stepped up their game and have decided that you as the landlord of a tenant that did not pay their water bill will be the victim due to the passing of HB 567. As you know, landlords have been legislatively made responsible for paying a tenants unpaid water bill even though the Water Authority has a contract between themselves and the tenant and not with you. Billing a third party for a product or service that they had no beneficial use of is not morally or ethically right. A. The Authority is now requiring you to provide an authorization form that signs the property owners rights away acknowledging that there is a contract between you and the water authority rather than just between them and the tenant. And if you don't they have decided that they will not allow water at your rental property essentially shutting down your business. THEY WILL NOT ALLOW YOU TO RENT YOUR PROPERTY WITHOUT GIVING THEM THIS AUTHORIZATION FORM. B. If the landlord has a lien put on their property from a tenant that did not pay their water bill, and the lien has been on the property for at least 2 months, they can shut down the landlords business by refusing to turn the water on until the tenants delinquent bill is paid. They say they are not enforcing this provision right now but we all know they eventually will. C. The Authority now no longer has to get a judgement against the tenant which was legally required before. 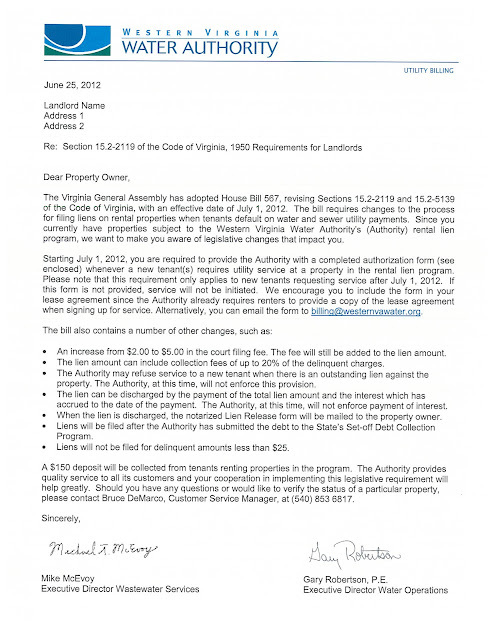 The Authority previously told REI of Virginia that they refuse to do so due to the cost of taking their customer to court, a cost that landlords have to face on a regular basis in order to evict a non paying tenant. There will be no way for a landlord to tell when doing a background check if they are renting to a new tenant that has previously not paid a water bill at another property. D. There is an increase of a court filing fee to the landlord from $2.00 to $5.00 which will be added to the lien amount. E. The Authority can now add an additional 20% to the tenants unpaid water bill in what they will call a "collection fee" in order to stick it to the property owner after the tenant doesn't pay their water bill. And the Authority can charge interest on top of that. The Authority appears to have decided that they will charge the collection fee but won't charge interest at this time. F. When the lien is released the Authority will mail the landlord a notarized lien release form which you can take down to the courthouse and have recorded yourself to release the lien. The Clerk can not charge the landlord for doing this at this point in time. G. The Authority will put the lien on the landlords property after they have submitted the tenants debt to the State's Set-Off Debt Collection Program which I believe is where the state attempts to take the money out of the tenants tax return. Do not pay any lien until this point as it appears that this is their ONLY means of debt collection from the tenant. H. The Authority can not legally file a lien for less than $25. The Authority is allowed to let the tenant build up a delinquent bill for 3 straight months. Any lien that small is not foreseeable due to this. The maximum that the authority can charge a landlord for is 3 months of delinquent tenant water bills. The Authority has made no decision to cut the water off at the drop of a hat due to non payment. I. Your tenants water deposit in this new "Program" will be $150. THE AUTHORITY IS REQUIRED BY LAW TO COLLECT A SECURITY DEPOSIT THAT WILL COVER NO LESS THAN 3 AND NO MORE THAN 5 MONTHS OF YOUR TENANT NOT PAYING THEM. Apparently the Authority feels that the average water bill can not go over $150 in 3 month period of non payment and abuse by your tenant. J. When the property is sold, the lien's rank as high as unpaid taxes so they will have to be paid before the mortgage gets paid. They are at a higher priority than the mortgage. K. If your tenant has Section 8 or is on ANY kind of Need Based local, state or federal rental assistance, the Water Authority will not be able to legally charge them a deposit so ALL of their delinquent bill will be paid by the landlord. So what is a landlord in Greater Roanoke to do? You can put all water bills in your name and raise your rents across the board to cover tenant abuse and non payment of water..... You can charge up to 2 months worth of rent for a deposit which hopefully will cover any liens that you may get however in these trying times it's hard enough for someone to come up with one month security deposit.... Are you going to have to change your rental criteria? Unfortunately this new "Program" makes it difficult to rent to those who get "needs based rental assistance" such as Section 8, etc. since they don't have to pay a water deposit and all delinquint bills will be paid by the property owner. Cost of doing business !! You chose to go into the business of owning rental property !! No, sorry, I would have to disagree. You are the type of person who has a defeatist personality. No matter what new regulations you are faced with you turn around, bend over and take it. However there are those of us that know and understand what is right and what is wrong and we fight for our freedom. You would be best off living in a communist controlled country Anonymous.